Did you know that October is Spinal Health Care month? We need to look after our spine… we only have one …. and it can`t be replaced. Chartered Physiotherapists working in the area of Musculoskeletal therapy are specially trained in treating back and neck pain. What will a Chartered Physiotherapist do? Plan a treatment programme to suit your needs. Your Chartered Physiotherapist will monitor your symptoms at each visit and will progress your treatment programme accordingly. If appropriate, your physiotherapist will liaise with your doctor, hospital consultant or other health care professional. You will be advised on return to work, sport, daily activities and given advice on preventing recurrence of your pain. Stretching, strengthening and postural exercises – a specifically tailored exercise programme targeting your problems. Also, group exercise interventions may be appropriate such as Pilates or the Alexander technique. Electrotherapy – ultrasound, interferential, TENS, laser or electrical stimulation may help speed up healing and reduce pain. Bio-mechanical assessment and prescription of orthotics (customised insoles). Prescription and fitting – of collars, pillows, spinal supports, lumbar rolls and corrective seating. 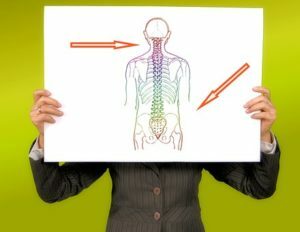 Assess and give advice – on ergonomics (working postures) to reduce unnecessary load on your spine. If you are suffering from back pain whether it’s ‘just a niggle’ or something more painful we can help you diagnose, protect and strengthen your back so that you can get back to daily life. Call us on 01 279 8181 to book an appointment with one of our highly experienced Chartered Physiotherapists.